Having a website is a great way to get people familiar with a brand and aware of the services that a company offers. However, while there are many firms that use their site as nothing more than a digital billboard to flash at those searching for products or services, savvy businesses and marketers have realised the value of integrating websites into the way they operate to make life easier for themselves and their customers. Enabling local updating of information on a website designed by a third party means that customers can be sure of finding up-to-the-minute details whenever they visit. If customers find the website useful as well as informative they are more likely to complete a transaction. Along with the development of the front-end of the website to make an attractive “shop window” for a company’s products or services, the way that a website is constructed behind the scenes can have a big impact on the way is can be used and be of use. 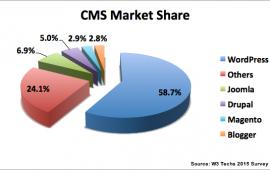 Content Management Systems allow web developers to develop websites that offer a range of online services and manage the way that information is displayed to the end user. It used to be that the only people who were able to put together websites were those with detailed knowledge of HTML and other web authoring tools such as Java and Flash. These days, however, using Content Management means that once the initial design has been done, the day to day management can be passed over to the company to ensure that information is kept up to date and new content can be added as necessary. Of course, it’s possible that any company that wants a website can start from scratch and build it themselves using any one of a number of Content Management tools. This works for a number of firms and can certainly ensure that a basic website can be put up for customers to access. However, for something that runs smoothly and has the opportunity for development at a later stage, it helps to have the initial set-up carried out by a web developer. Working with an experienced web designer means that a company can discuss their immediate needs and how they see their business expanding in future. Equipped with this information, the developer can build the website in such a way that future developments can be done in-house without compromising the way in which the website functions for those using it. There are many ways in which a website can be used to deliver value for a company that may not currently be fully exploited. Ensuring up-to-date information on events, opening hours, catalogue and inventory are all helpful to different kinds of companies offering services to customers. For an arts centre or a conference company, regularly updated events schedules with details on topics or performers can help customers decide whether or not they want to click on the link to book their tickets there and then. A stock list linked to an e-commerce engine allows customers to check online whether the product they want is in stock and purchase it with the click of a button. If archive information or historical documents is the business in question, having a searchable database with a system that allows booking for viewing or ordering of copies without leaving the website means an seamless service for website users and an easier and more profitable experience for companies. Having a website that is easy to access, provides accurate information and allows customers to complete their transaction wherever possible is an incredibly valuable asset for any company. With the basic infrastructure of the website in place, handing control back to the company with a Content Management System means that the limits of a website’s usefulness are only set by the time and effort the company is prepared to invest. Written by Nathan Griffiths who recommends you try use a content management system.